Man, I love a good road trip! Flying is great and all, but there is something really special about packing up the car, cranking up the tunes (or the podcasts), and heading out on the open road. We’ve always been the type that drive instead of fly. Not only is it often more affordable for us, but it’s also so much more fun! This month, we’re road tripping up to visit my husband’s family in Canada, and I’m starting to finalize the plans for our trip. 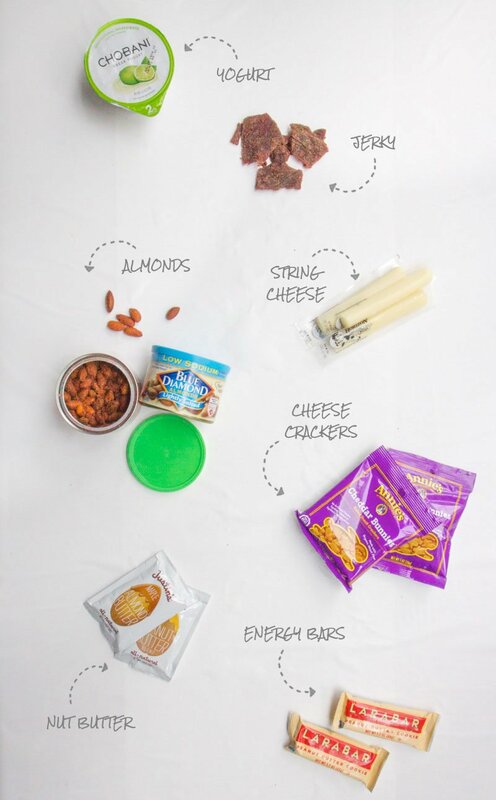 We’re building in a lot of travel time and stops to keep the little one happy, and of course, we’re packing tons of healthy road trip snack items. 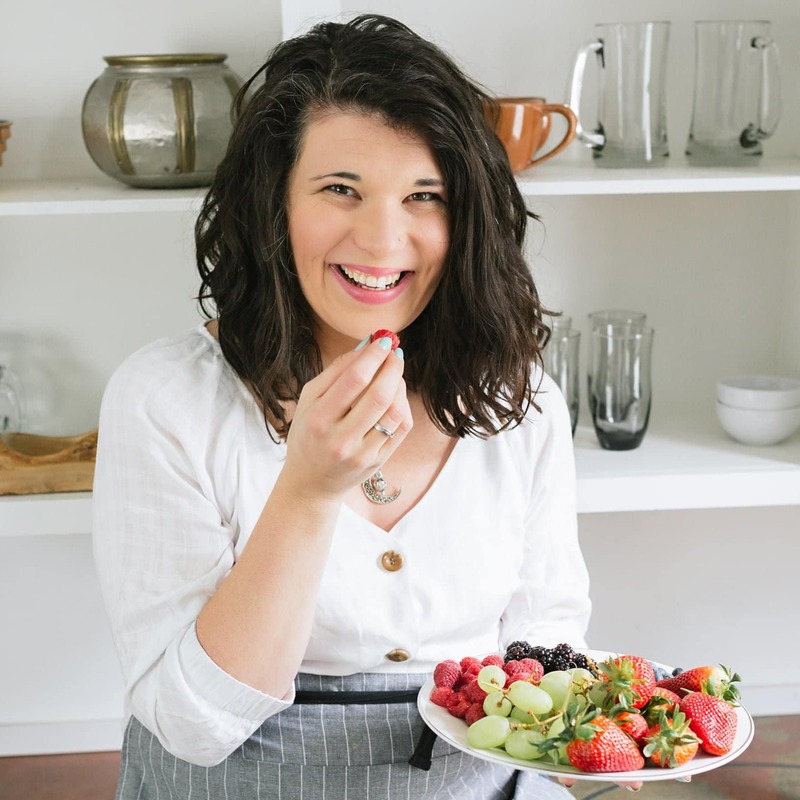 In an ideal world, I would spend the days before our trip in the kitchen, cooking up a storm, and creating lots of healthy, tasty, and homemade treats to eat on the road. I always plan to do that, but the last week before a trip is full of hair cuts and oil changes and clothes shopping and packing and house cleaning and booking hotels and planning routes and exactly zero time to spend in the kitchen making muffins to eat on the interstate. 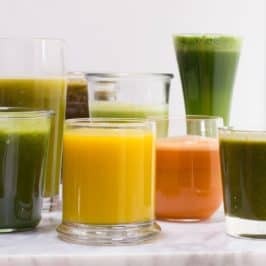 So I do the best I can, and search for lots of healthy, all-natural pre-made alternatives. Since we rarely eat this kind of pre-packaged food, it’s always a fun treat, and it saves me some serious pre-trip stress! 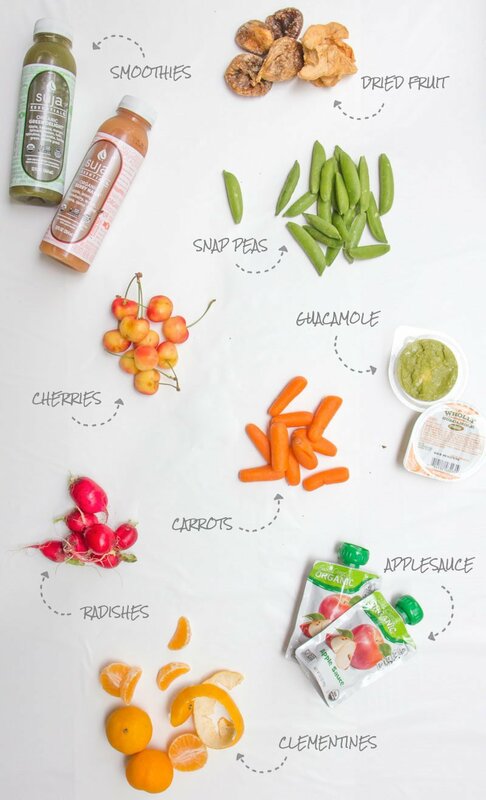 I thought I’d pull together a list of all of my favorite healthy road trip snack ideas (plus show you our favorite road trip lunch! 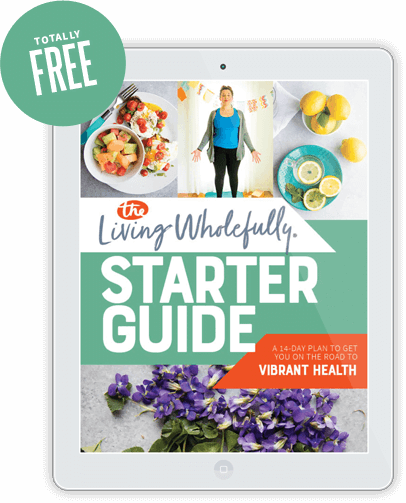 )—most of what you’ll see here is prepackaged stuff from the store, but I’m also giving you some homemade ideas just in case you have the extra time to whip them up before you go. Hopefully, you’ll be able to find some goodies for your next journey! Clementines :: bonus: makes the car smell amazing! Guacamole :: same as the ranch—we lurve those little guac cups for road trips! Road trip snacking is so often carb city—and often not very good quality carbs—that’s why you feel so hungry before you even get to the next exit! The key to road trip satiation? Protein! 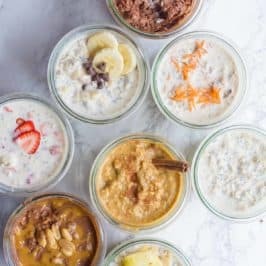 Yogurt :: look for higher fat versions with less sugar or make your own! 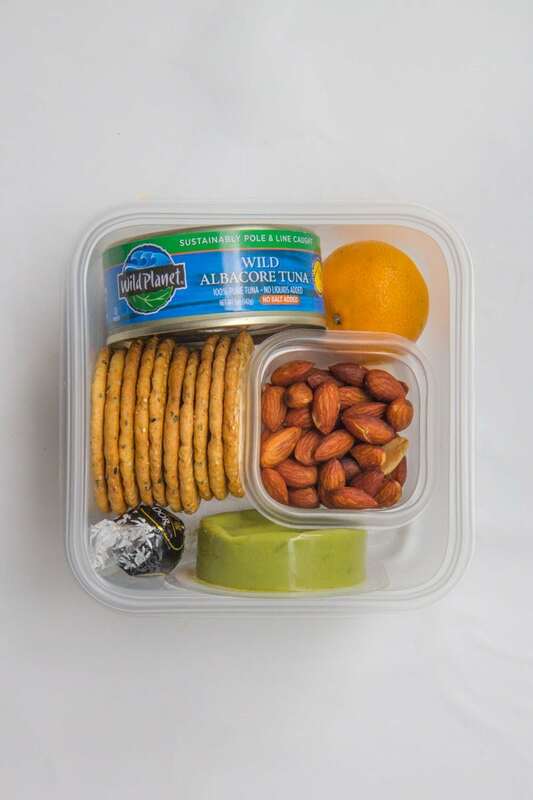 Almonds :: you can’t beat Blue Diamond’s snacking almonds for the road! Lots of great flavors to choose from. Cheese crackers :: tasty, and surprisingly high in protein! I can’t make it through a road trip without a little something sweet! Instead of grabbing a candy bar from the gas station, I like to pack my own (healthier) treats to grab in a chocolate emergency. I drink water 90% of the time at home (the other 10% being made up of coffee and beer), so I use road trips as an excuse to drink fun drinks! I’m all about the road trip beverages. Sure, it means we have to make pit stops more often, but that’s okay because it’s a good idea to stretch your legs frequently, and traveling is notoriously dehydrating. Drink up! 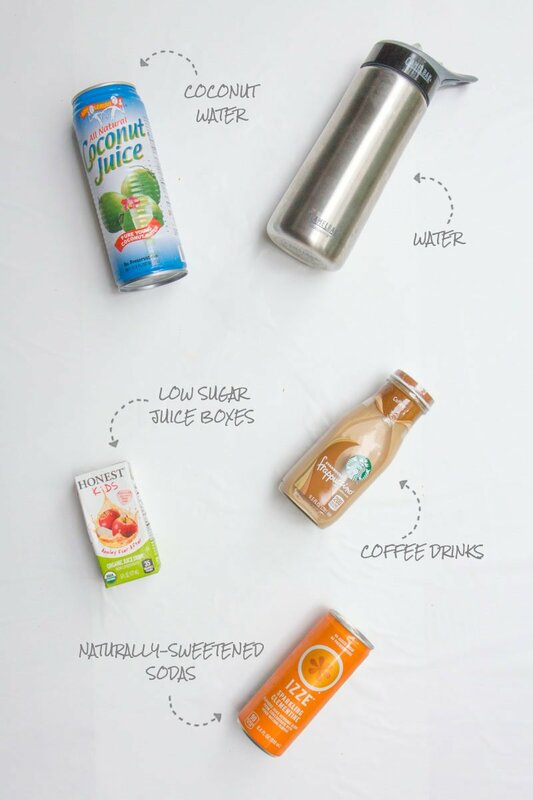 Juice boxes :: a fun treat, but make sure you look for ones with less sugar, and no artificial colors or flavors. On most items, you can do some serious condensing if you leave the packaging it came in at home. Pull everything out and repackage what needs to be repackaged into smaller stackable containers. 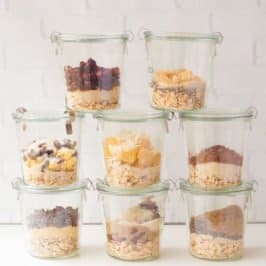 We try not to store food in plastic at home much, but on the road is one place where we love plastic storage containers. They are light, they stack and nest well, and if you lose or break one? It isn’t the end of the world. Instead of throwing everything all willy-nilly into a bag in the backseat, head to the dollar store and pick up an open tote to hold your non-refrigerated snacks. That way everything is easily accessible and easy to see. No digging through to the bottom of the bag to get the crackers you want. The tote does tend to get a little crazy at the end of the day, so each evening of the trip, I take everything out and reorganize and restock, if necessary. 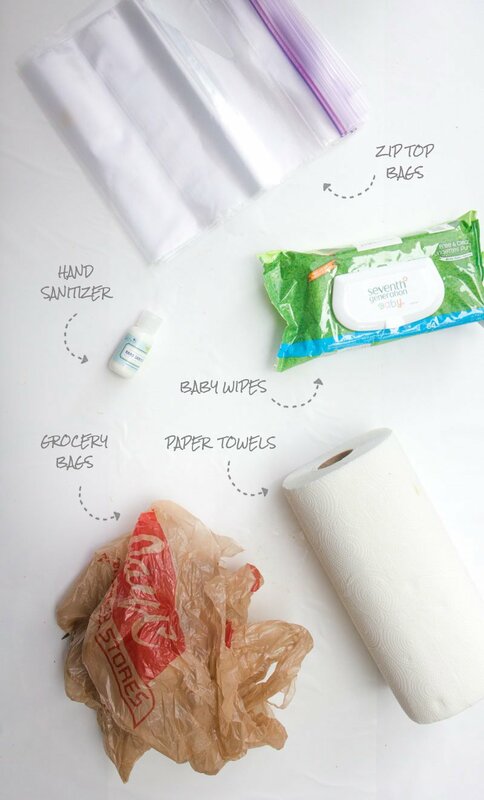 It’s never a bad idea to have a roll of paper towels, some baby wipes, some hand sanitizer, and utensils with you. Also, I recommend packing a few large, gallon-size zip top bags and plastic grocery sacks to work as trash bags. The gallon bags are particularly good to hold any food that would stink up the car! We went for years packing a cooler with sandwich fixings for the road, and it always worked out well, but it seemed like more of a hassle than it was worth. Recently, I had an inspired road trip lunch idea—tuna! Shelf stable, tasty, healthy, packed with protein, and substantial enough to feel like a real meal. We mix our tuna with guacamole to make a salad, and serve it on crackers—you could also pack little packets of mayo and relish or a cup of ranch for mixing. 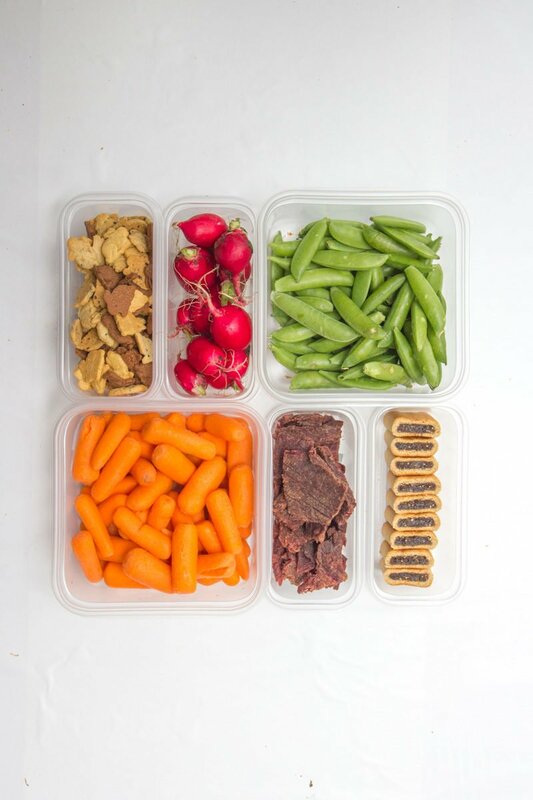 We pack little road trip bento boxes for on-the-go. Just empty it, mix up the tuna salad in the box, and eat! Just make sure you get a pull-tab style of tuna so you don’t have to pack a can opener, and I recommend eating it out of the car—unless you want your car to smell like tuna for the whole trip. It’s a good excuse to stop at a park and stretch your legs anyway! So there are my favorite road trip eats! I’d love to have you chime in with your favorites in the comments—I’m sure there are a few ideas I missed. Happy road tripping! Every good summer outing comes with a great summer snack! 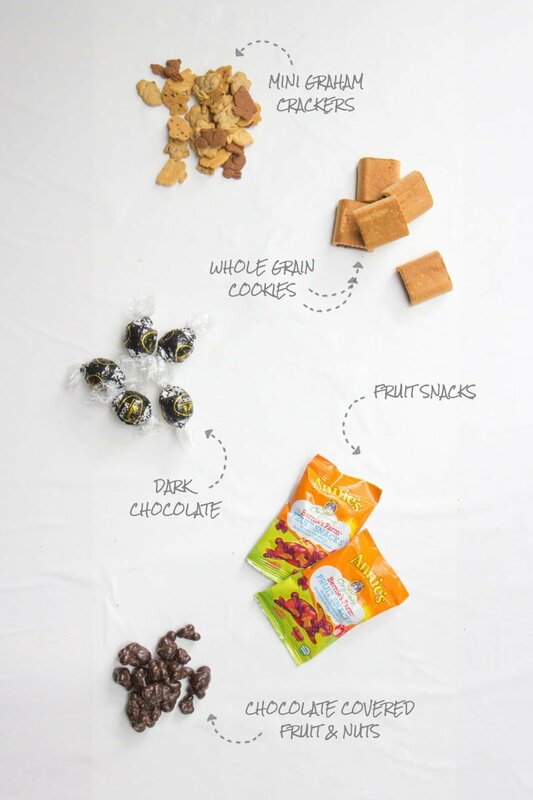 And Blue Diamond Almonds are just the snack to help flavor your adventure! This “Flavor Your Adventure” post is sponsored by Blue Diamond Almonds. 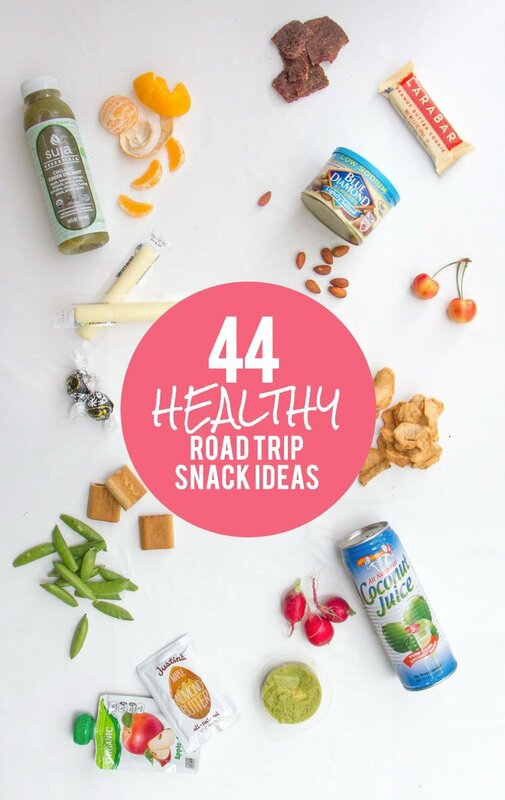 For more healthy road trip snack ideas to “Flavor Your Adventure” this summer, visit Blue Diamond Almonds on Facebook, Twitter and Instagram. All content and opinions are my own. Packing snacks from home for road trips are essential for me too. Not only is it cheaper than buying food on the way, but it’s healthier for me too. I think the best thing I took with me last time was homemade trail mix. It had my favorite nuts, dried cranberries, and some chocolate chips. We are big road trippers, too. In addition to the things you mention, we also bring tea bags and reusable mugs. Every gas station has hot water (for their tea), but this way you can bring along your favourite kind. I always forget to pack napkins! When I fly, since I can’t bring water, I take my water bottle empty then fill it up in the airport – many of them have the filtered bottle filler now! In the past I’ve brought hardboiled eggs and protein pancakes! All are great ideas! And now I’m hungry! Thanks for the ideas! We love homemade lunchables – cheese sticks, ritz style crackers and deli meat. That makes a great lunch! We also like to bring veggie straws or chips as something fun and snacky but not quite as terrible health wise as potato chips. Salsa is a great dipper that we love to bring. These are great! And don’t seem to messy either! Thank you! Thank you for your suggestions. We’re driving to Florida in a few days. Some great ideas. Lots of helpful tips! Thank you!! I would have forgotten the essentials of napkins and trash bags!! How do you keep some of your stuff cold on long trips? I saw on one website that water bottles can be frozen in advance to use for keeping stuff cold as an alternative to ice. That might help. So glad I stumbled across your site. Have now added it to my favorites and look forward to reading more! Thanks for the great tips. 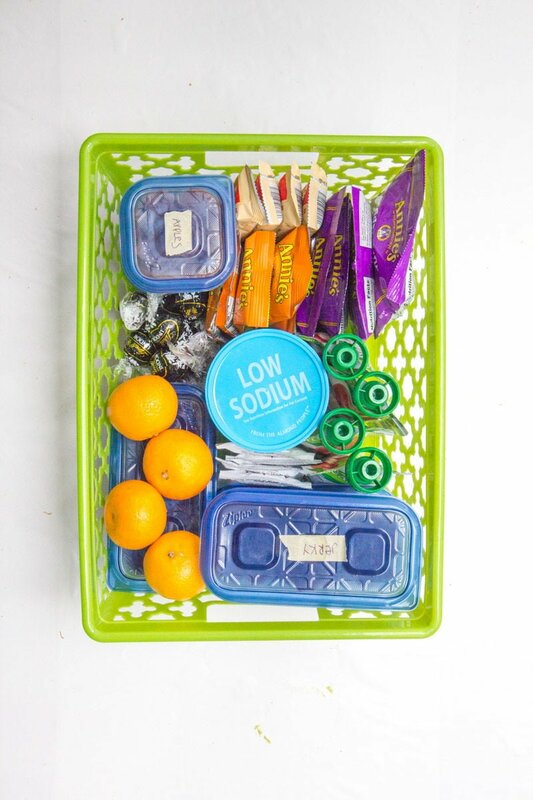 I love the idea of putting snacks in a basket so they are visible and more easily accessible! 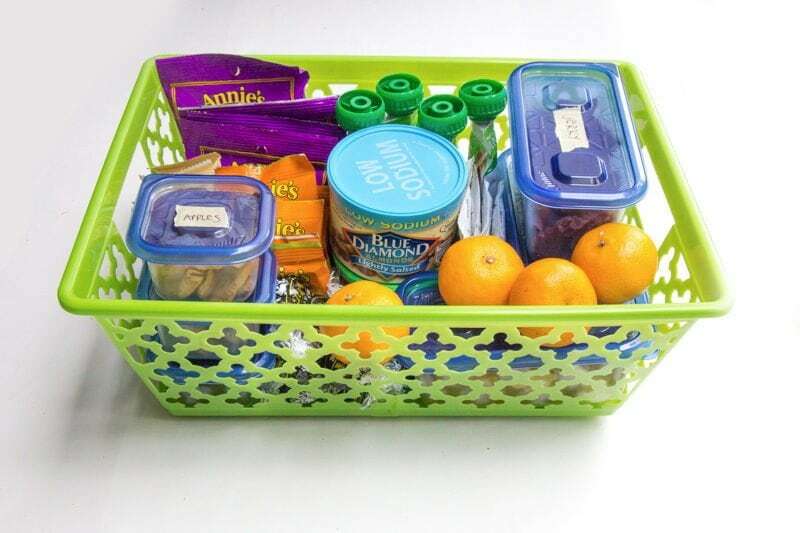 That basket makes road trip snacking SO much easier! 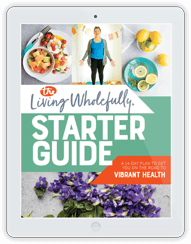 Welcome to Wholefully!! You need water always while traveling and i carry my water bottle with me. On a long trip, i use to carry my bad that always have snacks like you discussed above. Loved your post and the ideas you shared. Don’t forget to bring the yummy treats! Not just the healthy things. This is great! 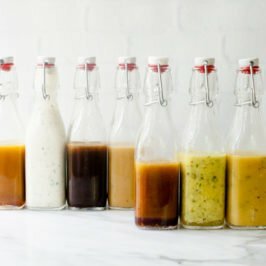 I’ve been trying to find an article for road snacks/light meals that aren’t junk food. Getting ready to go on a three day trip and I don’t want to spend a lot on restaurants! Im going on a white water rafring trip with my school and i have a lot of dietary restrictions and this helped me a lot. Thanks! I’m prepping for a 10,000 mile road trip that should take me about 2 months. Needless to say, I’ve been reading a lot of blogs and this one is actually really great! Thank you for making an awesome blog! The snack ideas are excellent, thank you. I’m leaving my one and only “forever” home to move 750 miles away in just eight weeks, and there will be some concession to “comfort” snacks, though I’m also successfully in the process of losing well over 100 pounds (and this is my 50th move in 46 years, every prior move having been right here in my native city in northern lower Michigan; no pressure on myself on this trip…). I also am just now healing from the most severe allergic reaction I’ve ever had in my life, one that did an enormous amount of cellular damage throughout my body, so obviously, eating healthy has now become THE priority in my physical life! 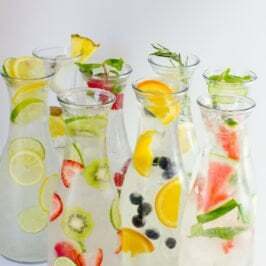 Freeze tea or juice in empty water bottles. They help keep stuff cold and as they thaw you have a cold drink. I have taken the 8 oz bottles filled have full of milk and froze. When ready to go on trip fill rest of way with milk. Nice cold drink. Great ideas! But no on the tuna, it stinks and for anyone who gets car sick in is really bad. I’m a huge fan of hard boiled eggs on my solo hiking road trips. I boil and peel a bunch before I leave and throw them in a ziplock in the cooler. I can eat them with one hand while I drive between trailheads, and they’re high in energy & protein for the hike. Instant oatmeal is easy to make in hotel room coffee pots. Just empty it into a coffee cup and run the pot without the coffee/tea bag. Don’t forget to bring plastic spoons! I also like Hawaiian sweet rolls. You can eat them straight and room temp without butter, or tear them in half and make a little sandwich. I often buy a tub of premade potato salad, pasta salad, or chicken salad that I can just eat right from the carton with a fork. Hummus dip with veggies or pita chips are good for snacking. I usually stow away a some peanut butter and a small jar of unopened jelly outside the cooler for the last few days when fresh food will have gone bad. I always need coffee, but I don’t like to stop, so I bring a bunch of individual cans of cold-brew, popping them in the cooler one at a time. I refuse to use ice in my cooler because everything inevitably becomes a wet mess. I only book motels with fridges so I can use small ice packs and refreeze them every night, while giving my food some actual fridge time. I have a Lifestraw filtered water bottle that I fill up from whatever stream I’m hiking near, and it can also filter unpleasant tap water at small-town motels or gas stations.